Today I am giving a warm welcome to Monday. We took the weekend to focus on family fun activities and hosting some friends and family. It felt really good to take a break from projects and the renovation, Bryan and I both needed a bit of a breather. It is still a giant post day! 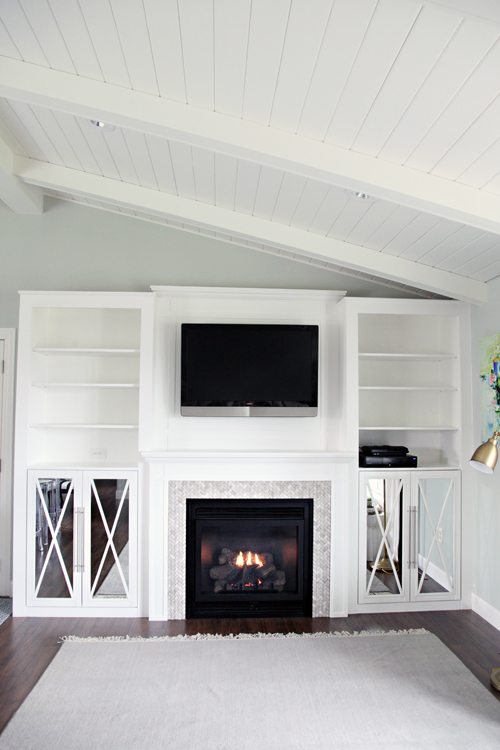 I have finally compiled all of our photos and notes to share our fireplace built-in project, which we revealed here. We started purchasing the supplies on a Friday evening and about a week and a half later, we were tossing items onto the bookshelves for final photos. A total of ten days in the making, this wasn't an overnight project, but it is one we are so incredibly happy with. Given the number of photos and steps, I probably should have broken this into a couple of posts, but it always creates confusion down the road so I am piling all of it in a single place today. Who's ready?! Things have already changed a bit in the living room since the reveal, however, I will share more about that in an upcoming post. Nothing major, just little tweaks as we live with things. But now that you have seen the finished fireplace project, let's start back at the beginning. A fireplace has been on our wishlist for many years, and as an effort to keep this our "forever" home, we decided it was now or never. Of course, we love how they look, but more importantly, it will be a nice source of heat for over half of the year in our cold weathered climate. And is there anything better than curling up near a fireplace with a good book or magazine? I have already done this multiple times and I have to say, it is fabulous! Truly a home dream come true for us. Wall mounted television to allow us to view it while cooking at the island in the kitchen, while sitting at the dining table and of course, while relaxing in the living area. A combination of open and concealed storage. A design that would mimic the style of the cabinets in the kitchen to marry the two spaces. Narrow enough to reduce the amount of lost floor space. Salvage the DIY'd glass doors we created last year. Based on those bullets, I whipped up a design that fit all of our wishes and presented it to Bryan. Given the overall size of the built-in, we knew it would have to start in the corner of the room, vs. being centered and leaving negative space in the corner. 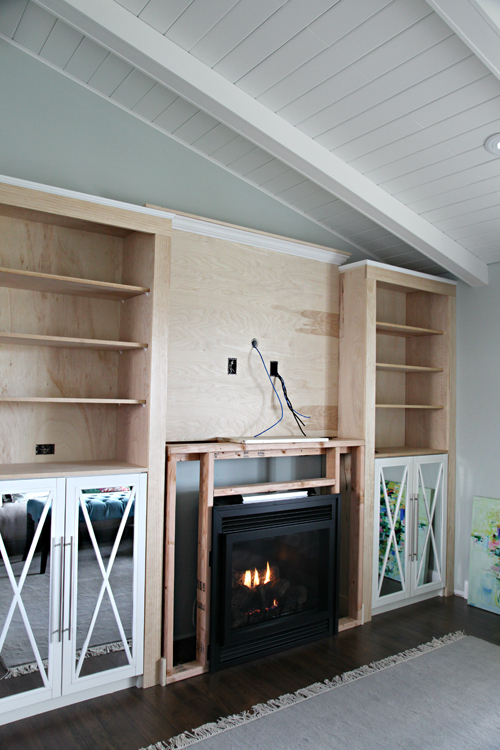 After we measured out the existing mirrored cabinets as well as the fireplace insert, we came up with the remaining measurements for the surround and shelving. 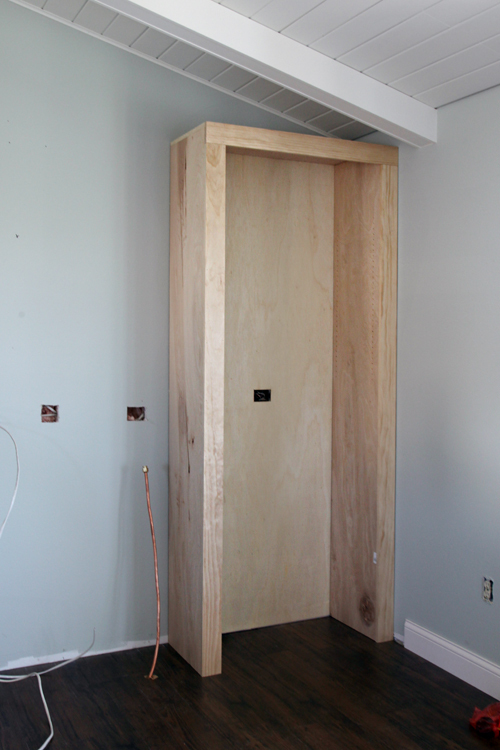 In total, the built-in ended up at 134" wide x 92"/96" tall x 16 1/2" deep. Because we wanted the fireplace mantle to be embellished with decorative moulding, the moulding needed a solid surface to return to on either side. That surface would be the sides of each bookcase, and we ultimately landed on a 3 1/2" wide frame for the bookcase walls (using the poplar 1x4's on the bookcase faces). 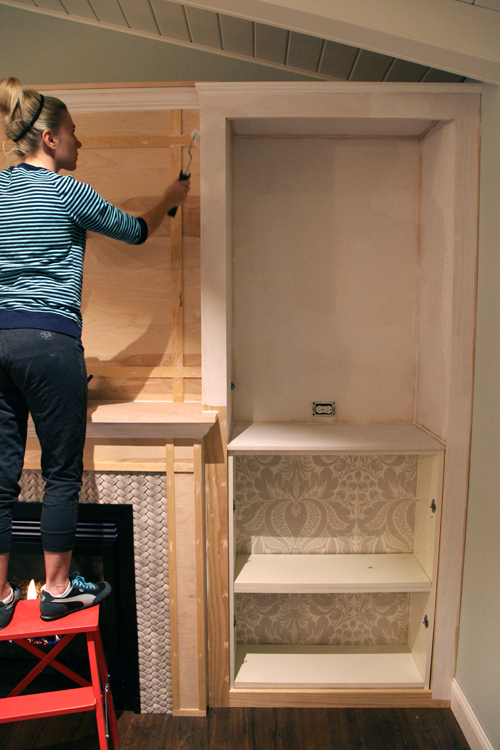 We began by using 2x4's and the 3/4" birch plywood to create a box to surround our previous mirrored glass bookcases. We pre-measured our components with their cords attached and determined we needed shelves that were at least 16" deep to hold the electronics. 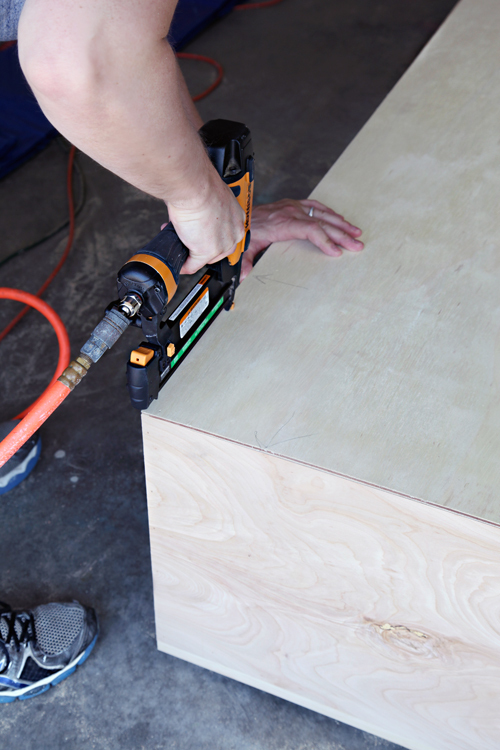 Once the exterior of the box was built, we added a 1/4" birch plywood backing. 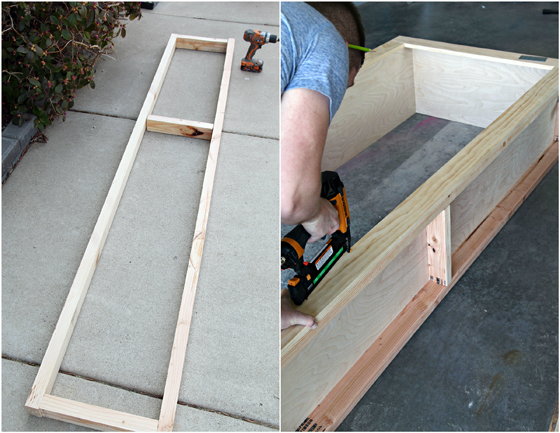 Wood screws were used for building the 2x4 frame while the brad nailer was used to affix the plywood sides and backing. We had a few shelving options, but I preferred something that offered flexibility vs. affixed permanent shelves. 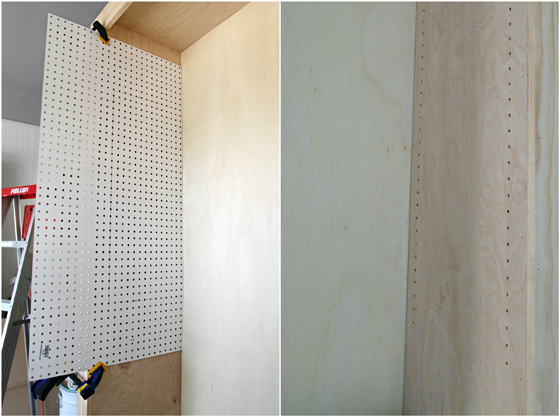 We simply used pegboard to create a template to drill shelving peg holes. We were able to time the building of this unit with our electrician, and he was on-site running the wires for the outlets, fireplace, and television as we constructed the unit. 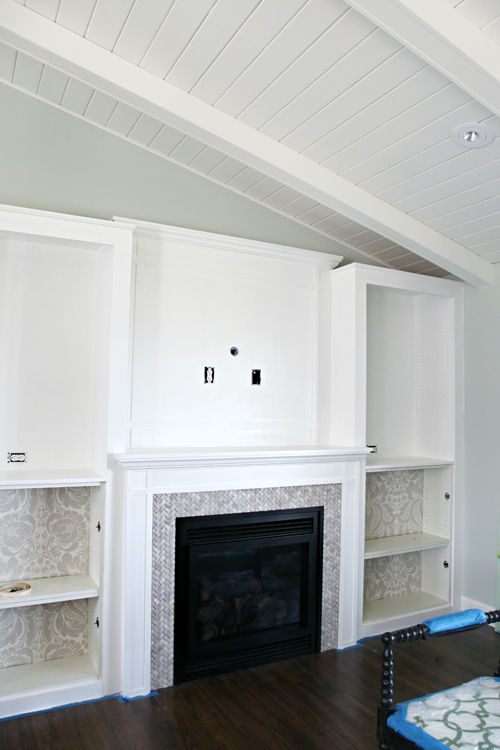 He was able to have our outlets moved to provide electrical for lighting and electronics in our bookcases. 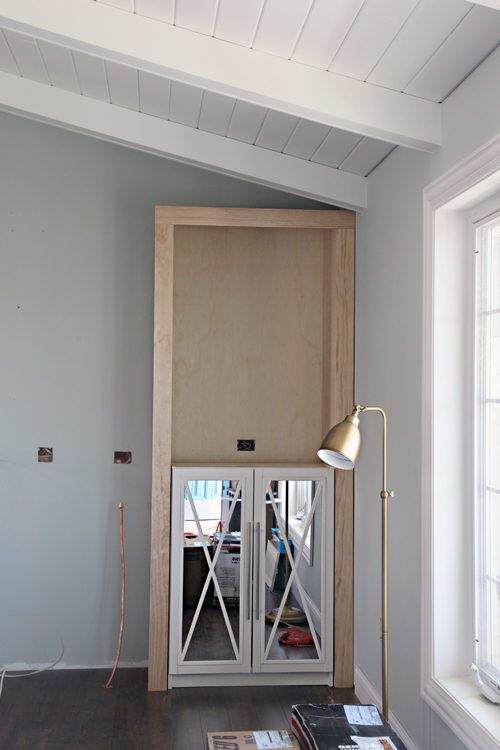 The beautiful bookcase frame was finished and we held our breath as we inserted the previous glass-doored unit. Wahoo, it fit like a glove! 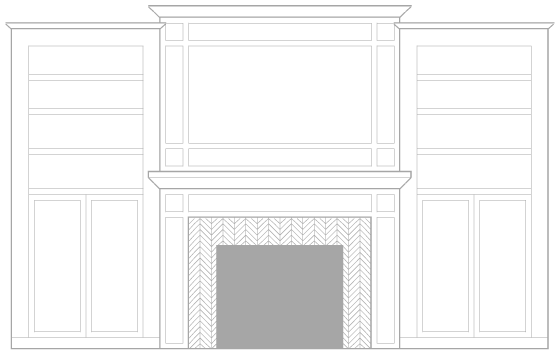 Once the first bookcase was built, we used the measurements provided to us by the fireplace company to construct the fireplace surround from more 2x4's. As I mentioned, I really didn't want to see component cords. I find them to be visually distracting and was ultimately trying to achieve a nice and clean look. Not wanting to do anything permanent that we wouldn't be able to access once everything was built-in, Bryan came up with the solution to add a PVC tunnel to run all of the cords between the television and components. That way, should we swap out a DVD player or need to replace our Dish receiver, we can do so without any difficulties. Electrical, Internet and cable was run by our electrician to a location behind the television and eventually boxed into the built-in, while the PVC pipe was installed to run between the TV and side bookcase cabinet. And this is where we were at the end of our first weekend of building. We needed to have our building inspector check on the electrical and gas updates Monday morning, prior to the fireplace insert installation (which was also scheduled on Monday). We didn't install the fireplace, we hired that part out (we went with Comfort By Design for this). Once again, we sighed with relief when everything fit like a glove. Above, you can also see how the television boxes were placed and everything was concealed by another piece of the 3/4" birch plywood. 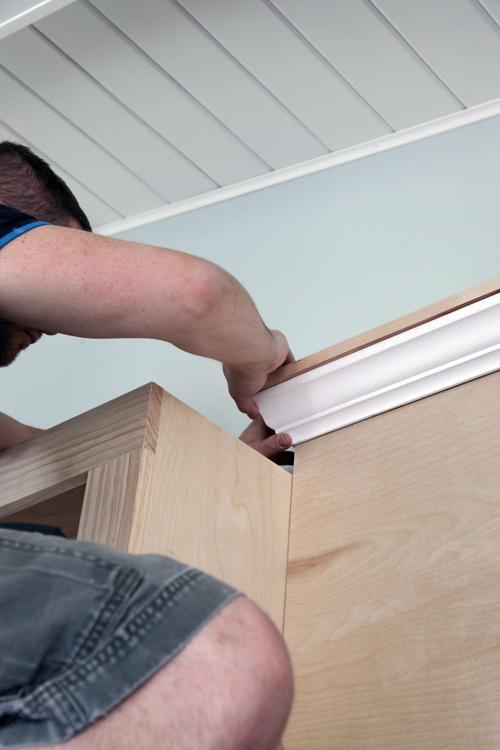 For the crown moulding, we used IKEA moulding on the outer cabinets and primed moulding from Home Depot for the center unit. 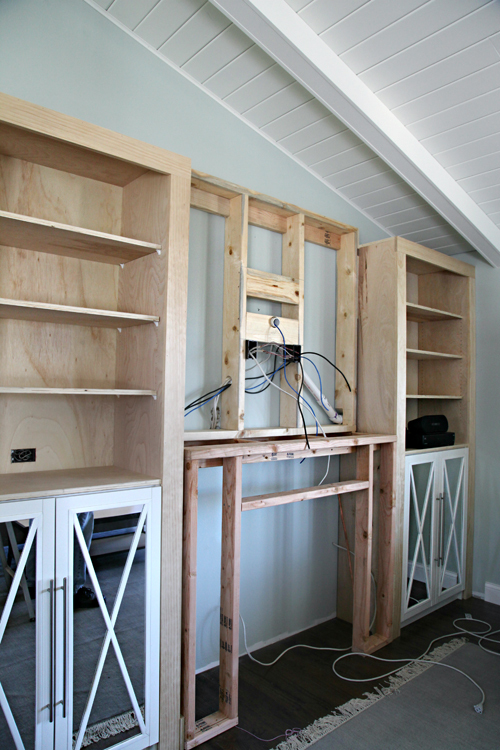 The outer bookcases were built to the exact height as the cabinets in the kitchen, which will also be moulded with the IKEA trim. This was one of the ways we began creating cohesion between the kitchen and living spaces. 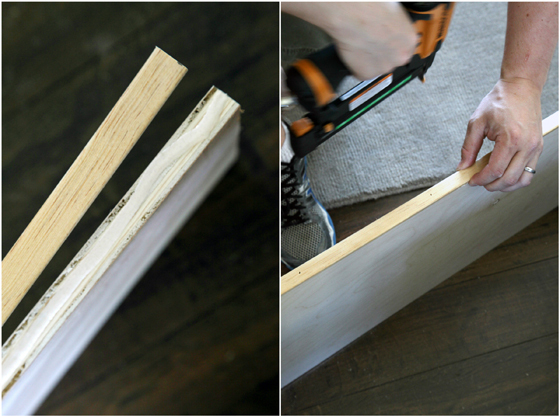 We also added small stripes of trim to the faces of the 3/4" plywood shelves. Wood glue and brad nailer for the win. 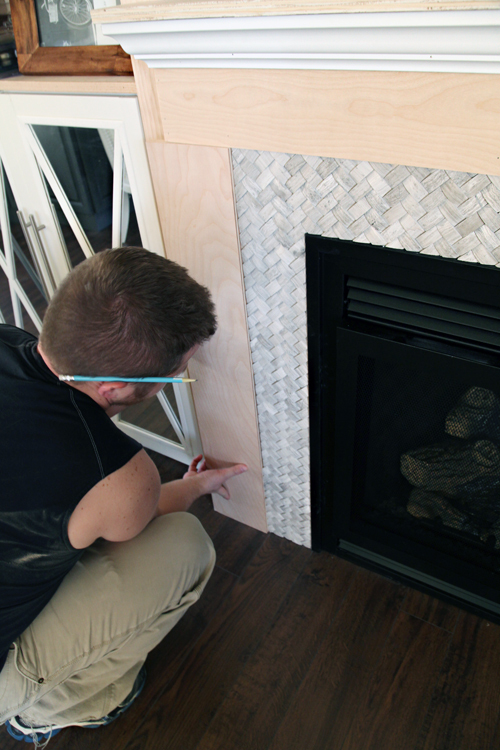 Now that the fireplace was installed and the moulding, shelves and built-in were complete, we were able to start tiling the fireplace surround. 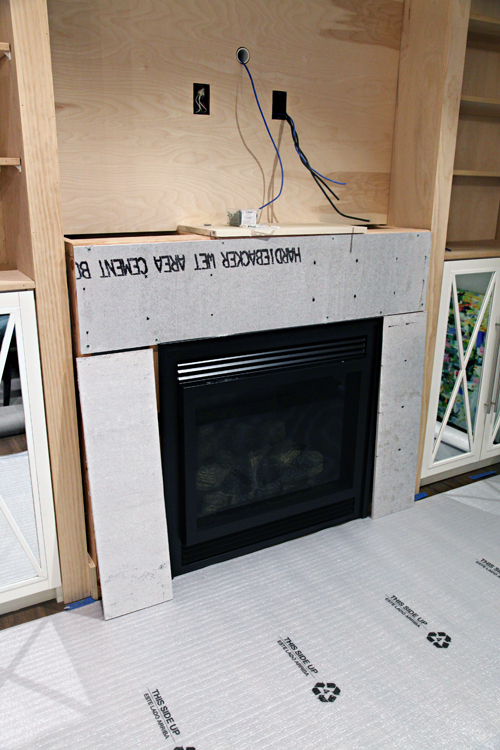 To prep the fireplace for tile, we purchased cement backer board. The board cut like drywall, scored with a utility knife. To affix the boards to the 2x4 framing, we used special backer board screws. 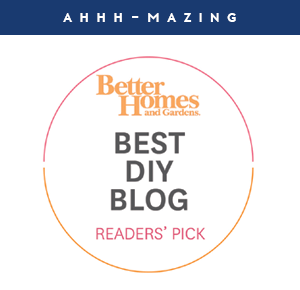 I originally had selected a herringbone marble from The Tile Shop, but when we were walking the aisles at Home Depot, I spotted a herringbone tile like nothing I had seen before. 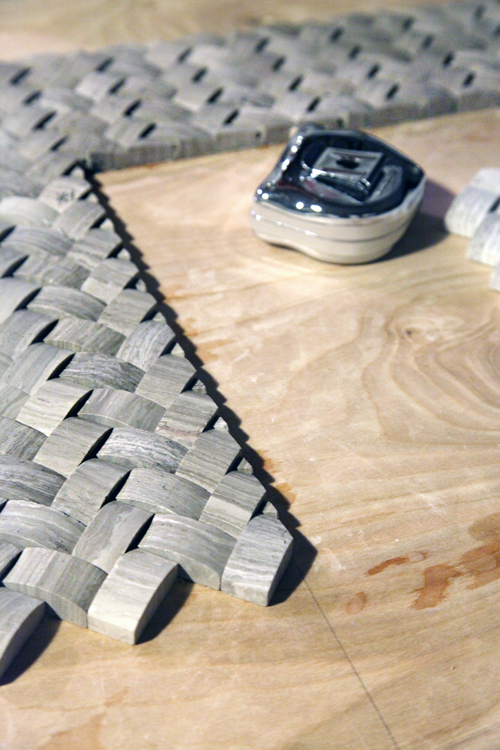 It offered a basketweave-like texture, which I loved because it almost looked more like a stone than a polished marble. We were able to borrow a friend's tile saw, and it cut like butta! 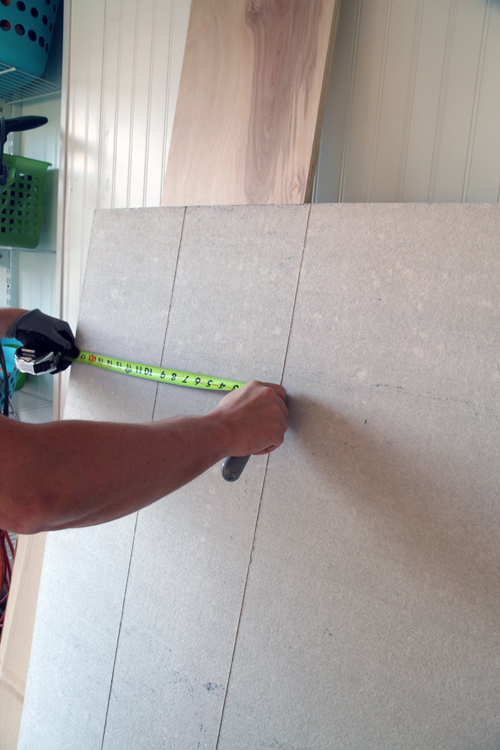 We drew out a template of the fireplace on a board to utilize while measuring and cutting each sheet of the tile. 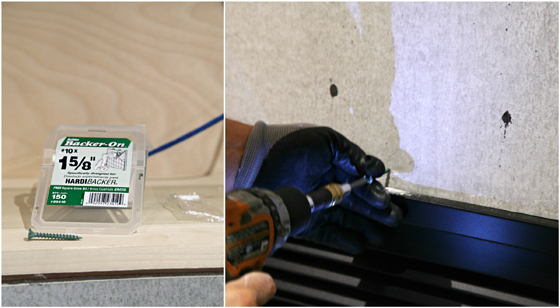 This allowed us to be sure that everything was going to line up and install without issues once we began spreading the adhesive. To affix the tile, we went with a tile adhesive which we spread on the backer board with a fine tooth trowel. We followed the directions on the container and worked our way around the fireplace accordingly. After all of the tile is set, we recommend holding it in place with painter's tape or masking tape to prevent any shifting while it dries. 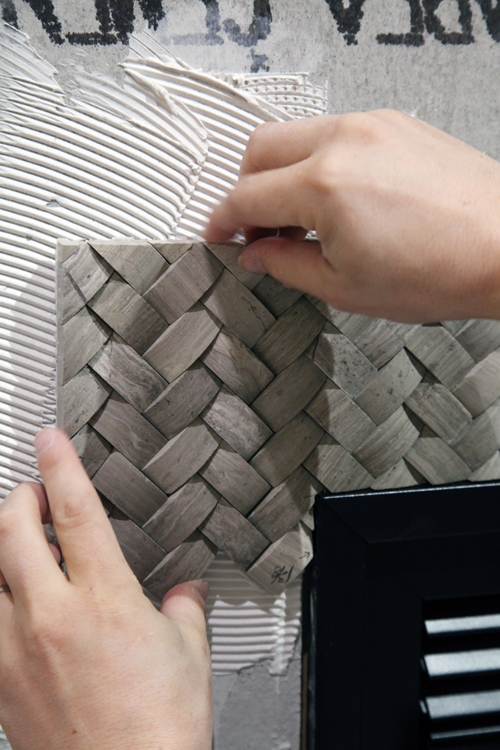 For now, we have not grouted this tile because it is so tightly woven and the texture would make it nearly impossible. In fact, Home Depot told us not to use grout, however, we are still looking into that because we have never not grouted a tile project before (and we can add grout at any point in time). Once we decide, we will also add a sealer to the tile as well. After the tile was set and cured, we began constructing the mantle. 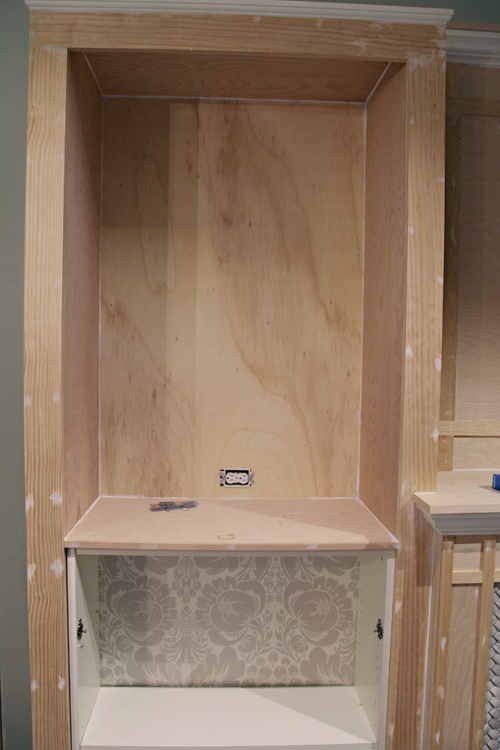 The mantle was another piece of the 3/4" plywood paired with the decorative crown moulding. We also finished adding 3/4" boards to the perimeter of the tile. The lattice strips were cut and affixed to the surround and upper TV portion to add a decorative embellishment (based on my diagram above - I forgot to photograph this simple step). We also added some iron-on edging to the cut edge of the mantle as well as the top moulded cap, and proceeded to fill in every last nail hole and gap with painter's caulk for a seamless look. 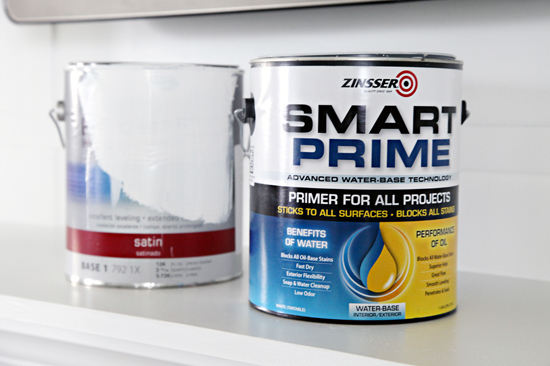 When it came time to paint, I used Zinsser Smart Prime paired with Benjamin Moore Advanced Paint in Simply White Satin. I was really happy with the quality and finish of both. I used a microfiber roller on all of the flat surfaces, and my favorite brush for all of the cracks and corners. One coat of primer and two coats later, it was already looking good! The paint really cleaned up the entire build and made it feel like one meant-to-be unit. I ended up doing one more coat before pulling the tape and celebrating! 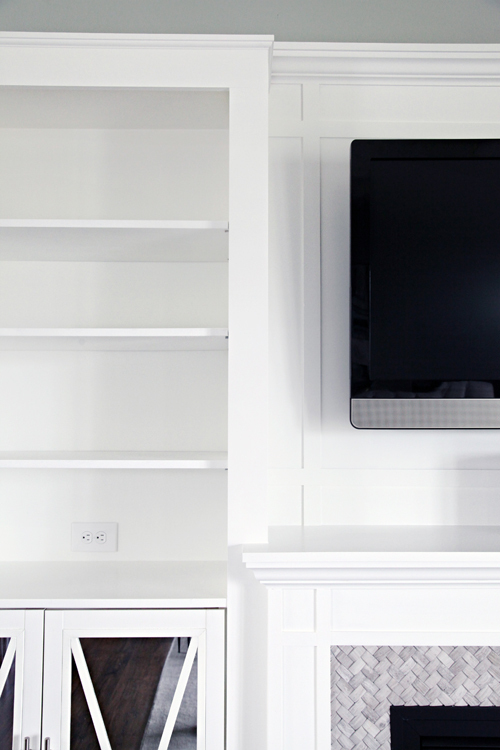 The TV mount offers both tilt and swivel features, allowing us to pull it out and face it wherever we would like. We started off with a variety of shelving pegs that we found in our toolbox, however, I ended up purchasing some smaller pegs that were less visually distracting. We eventually plan to create a "faux" panel that I can add to the backs of the bookcases when the painting or wallpapering mood strikes. That way I can change things up without doing anything permanent I may regret down the road. We also hope to add decorative lighting to the tops, and the outlets added to each side will come in handy when that day comes as well. I am so in love with the tile and all of the moulding and trim details. The final result is definitely a functional moment-maker! Most of this project was far from pretty and I had multiple moments throughout the construction process where I wondered if it would all come together as envisioned. But it did! 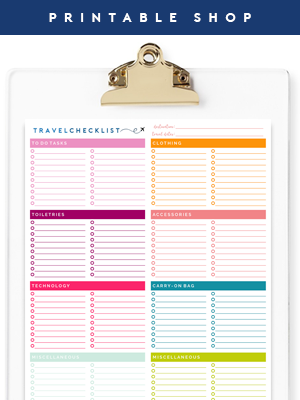 In fact, it exceeded our expectations and we are happy we were able to achieve all of the goals and finally check off a big home wish list item. Just in time for the hot summer, ha! I'm constructing fireplace also and almost ready to tackle tv/wiring. I liked the pvc idea, and you said easy to change out equipment when needed, but then panel was set covering wires. Is this removable? Thanks, its beautiful! The panel did cover the wires but everything is wired to the face of the panel (all of the electrical, cable, satellite jacks, etc... are boxed directly behind the tv at the panel, not behind it) and the tube is also accessible behind the television and also in the bookcase. 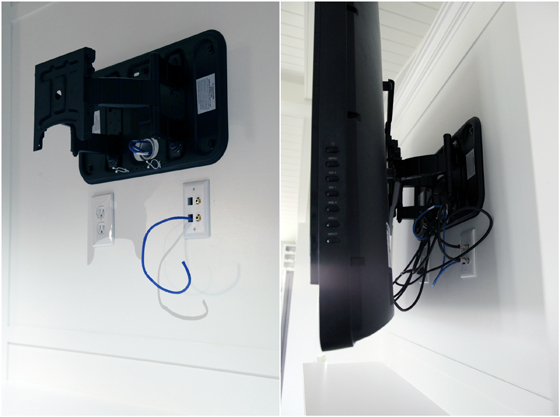 This allows us to fish the cords through the tube between the TV and components. Essentially the panel became a new "wall", it just allowed us to create the tunnel system behind it. It was not designed to be removable, but really we shouldn't have a reason to remove it since everything can still be accessed directly behind the TV. Wow! You two are incredible...I hope your built-in gives you years of joy! And the detail on the tile is simply stunning...I loved it in your reveal but now I'm also in love. This is so phenomenal!!! Love it!!! What a beautiful fireplace! Absolutely gorgeous! Love, love, LOVE! I also love your use of bright and bold! Gives this room a lot of personality! Beautiful tile! I was confused by the grouting statement. Are going to grout this tile or looking for a tile project to practice your grouting skills. Personally I think grouting the basket weave would actually cover up the basket weave effect and may not be the best thing. I am just continuing to research if there is a way to grout textured tile or if we are OK leaving it as is. 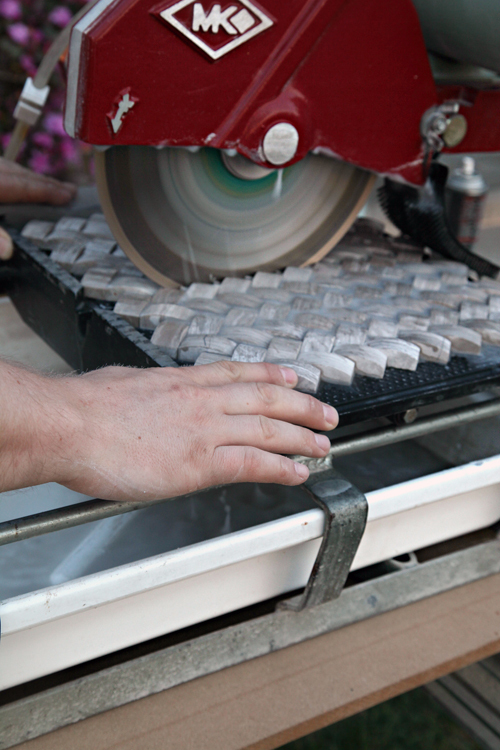 I know that grout is used to prevent the tile from moving or shifting after installation, and we definitely don't want that to happen, so we just want to be sure prior to sealing things off. We don't have plans or intentions of changing the tile, we really love the color and texture it offers. :) xo! The tile: swoon. Reminds me of a cable knit sweater. 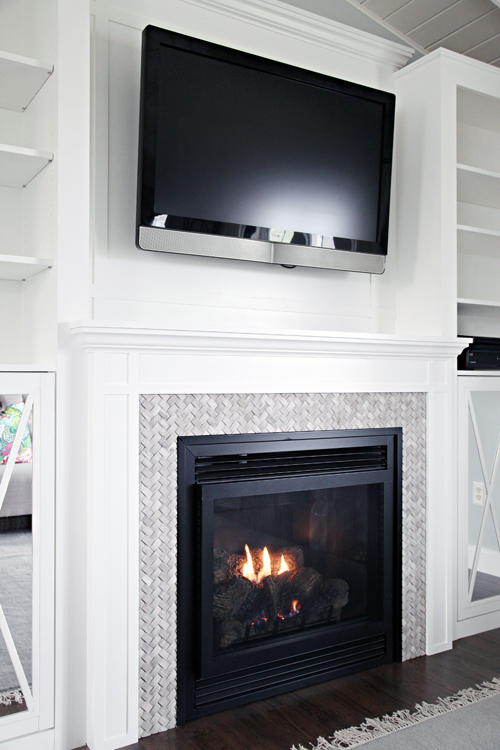 So cozy around your new fireplace! It has been so fun to follow along from the beginning of this project. I LOVE IT!!!! It all fits together perfectly . Wow! That was sooo much work for y'all but such an amazing result! 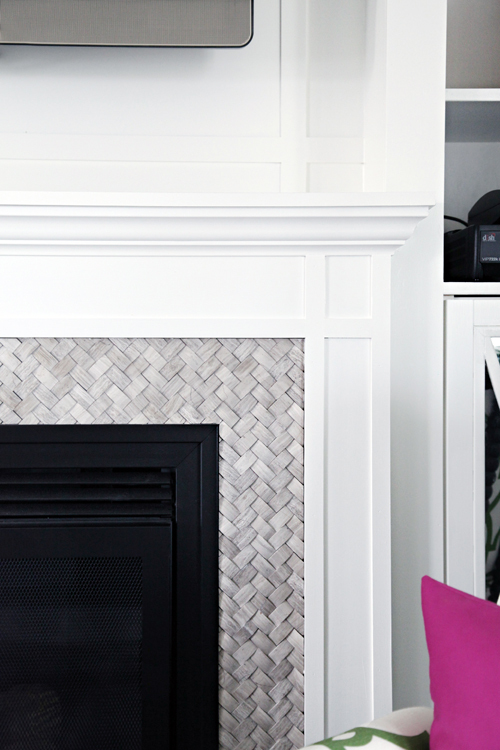 I love the herringbone tile too! Thanks for sharing! I love your new space (loved the old space too)!!! It's amazing that you built this all yourself. You're all quite talented! Love the herringbone - the texture, the colour, everything about it! The tile is amazing! Planning to use that for our fireplace too. Please follow-up if you decide to grout it, as my hubby is not convinced it can be left grout-less. A fireplace and mantel will be perfect around the holidays! 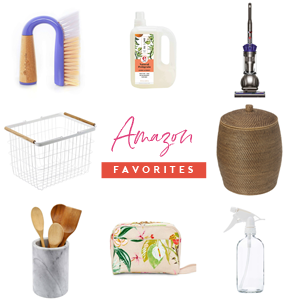 It's a great space to decorate ;) Although I love the coziness that our fireplace provides, I secretly love it for its endless decorating options! Hehe! Even if our next move takes us to a warm climate, I will NEED a fireplace and mantel! Wow, that piece of furniture is incredible! Congrats on a successful build. It looks phenomenal in that space! I love seeing this project from start to finish. Also, I love the tiles around the fireplace. They really finish the space nicely. 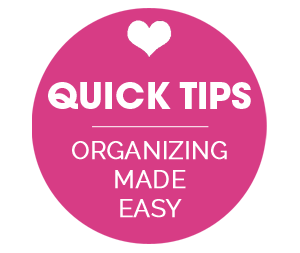 You and your husband have done an incredible job in your living room and kitchen. 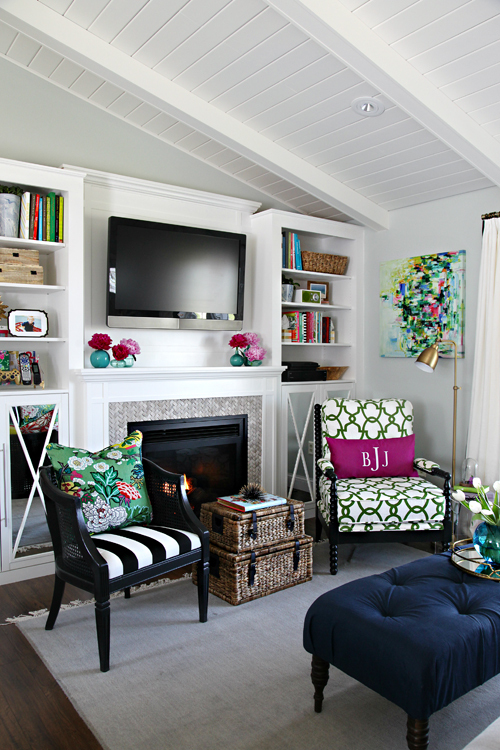 I love this project and your living room is beautiful! Seriously love your room! 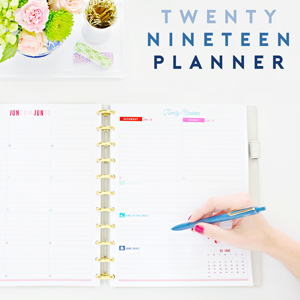 What software did you use to draw up your plans? I have several projects that need to be drawn up first. How beautiful is this... LOVE that tile in a basketweave pattern (and NO GROUT). This is amazing! What a fabulous project and the tile adds the perfect texture--love it! The basketweave tile is STUNNING. Never grout that, you will lose dimension.What a beautiful transformation. Just gorgeous Jen!! I'm in awe of your mad DIY skills. Amazing!! I love the way you incorporated the mirror cabinets from your last unit. A fireplace would totally be my dream... even though we live in a hot climate... still working on hubby to agree to that one. ;) There's nothing so relaxing as staring at flickering flames. And yours is divine. It looks absolutely gorgeous! I am a big fan of the built-in look. You guys did an awesome job. Your home is just stunning! Such attention to detail. You are proof positive that a home does not need to be a mansion in order to be gorgeous. I'd love to hire you to do my place but I'm sure you'll be more interested in enjoying your finished home than in taking on someone else's project. Kudos to you. Beautiful work!!!! This is beautiful - I love the tile! I am the furthest thing from a DIY'er, but if you're concerned about whether to grout, would you be able to grout a leftover piece of tile to see what happens? Absolutely love this project!! Any chance you could do a general cost breakdown? Hubby has been wanting to add a fireplace to our house ever since we moved in. Thanks so much for your blog and everything you do! The fireplace unit plus installation and gas hookup was around $3,400, which was the bulk of the expense (that didn't include electrical, just the unit, gas and venting). The wood for the built-in came in at $520. The tile, backerboard and adhesive was $125. Paint and primer was around $85 (but that was purchasing Benjamin Moore from a specialty paint shop, so that portion could definitely be done for less). I love the simplicity/elegance of your mantel flowers. Curious question.....your family is so young, why do you feel this is your 'forever' home? As those boys grow (believe me I have 2 boys and know how much space teenage boys take up!!) you will need more room! I know that there are things that could change our mindset down the road, but for now, we feel like there is something special about the boys being raised in the same home their entire lives. We built our home 14 years ago and have found ways to make it work for us ever since. Being that we were able to build it so inexpensively so many years ago, has also been a big advantage financially. We have thought about moving or upgrading (even completely relocating), but at this point in time that would mean starting over on our mortgage and most likely doubling or tripling it to get something similar in size. 2,300 square feet is plenty of home for us to manage, I have never had desires of a large home with a lot of upkeep (this one is hard enough to keep up with most days). We are close to my husband's work, our family and schools and with our oldest already starting high school next year, we are content just staying put. xoxo! 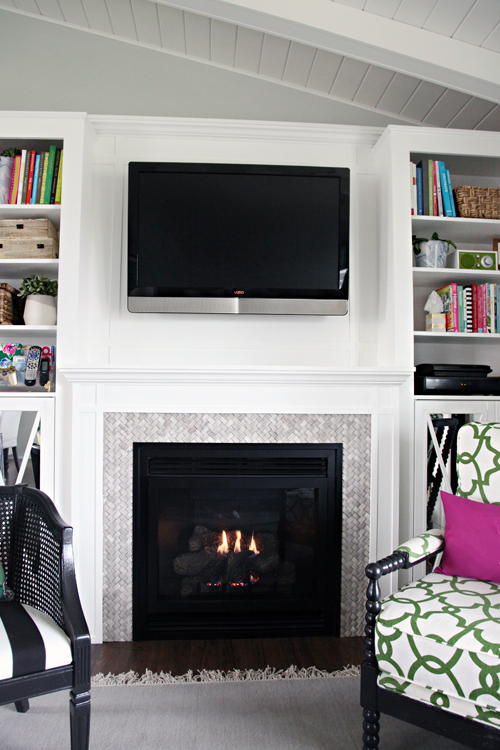 We are in the planning stage of adding a fireplace to our family room too and I love the look of yours. 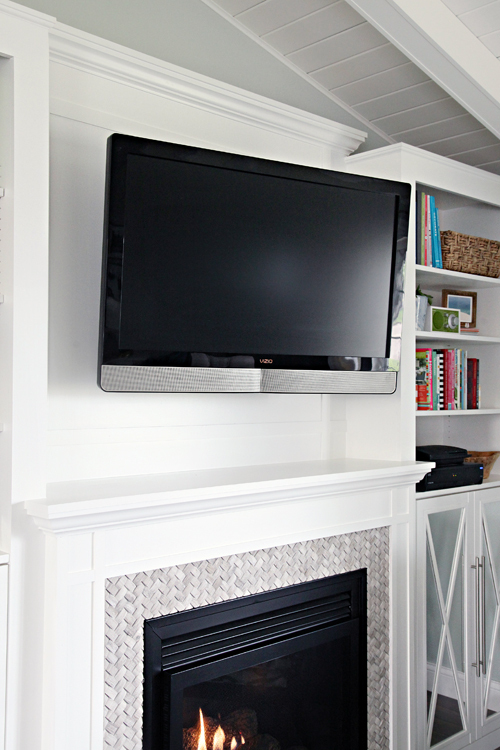 We are a bit concerned about the comfort of viewing the TV when it's above a fireplace. Do you mind sharing a few measurements about yours? Is the height of the TV okay for television viewing or does it feel high? Do you mind sharing how high your mantel and TV above are? How far away is the couch? The mantel ended up at 47" and the bottom of the TV landed at 10" above that (57"). We probably would have placed it 2" lower if we had to redo it again, however, it is about eye level when standing and not at all bothersome for viewing (in our opinion). We do have our sofa facing it directly and the back of the sofa is about 11 feet away from the TV. This is awesome Jen! We are just about to start built-ins in my daughter's new bedroom (we are finishing our basement) and I LOVE the pegboard template for adjustable shelving. Brilliant! Where does your fireplace vent? Is it an exterior wall on the other side? The fireplace was piped directly out to our garage (the wall behind our television is a garage wall) and then piped up and out through the roof. This prevented the need to have the piping run directly up the wall behind the television inside of our home. Do you have an item number or name for the tile? I love it!! Wow thats great! you are very talented! 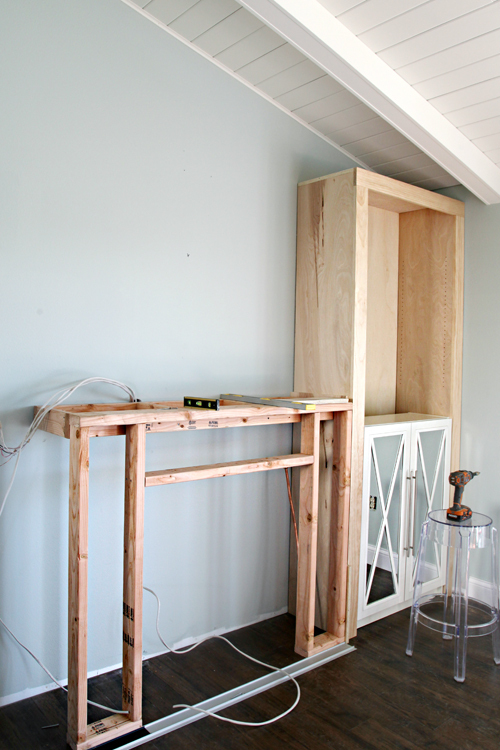 is the cabinet free standing or did you mounted into the wall? Hello! I love this, we are doing something very similar in our living room. What is the length of the mantle area? Also what size tv? Thanks! Our mantel is 61" on bumped out edge, inset width where tv is is 56"... TV width is 40.5" (42" diagonal TV). This is fabulous!!! I am loving the tile accent. Love all of this. I'm currently trying to figure out how I can add a fireplace to my house without spending a fortune. What kind of fire place is this? Do you mind me asking how much it was to have installed? You did such a beautiful job on the cabinets! My mom is redoing her fireplace and hearth after 47 years and loves what you have done. Thank you for the idea. I have a question about the background of the shelves/cabinets. Did you stencil the pattern, was it wallpaper or did you wrap paper on cardboard and insert it? I utterly love it and have been thinking about doing something similar with our bookcases. Thank you so much! Thank you Nancy! Because I didn't want to do anything permanent to the backs of the bookcases, I wallpapered very thin panels of wood that were cut to size, and placed them behind the shelves. 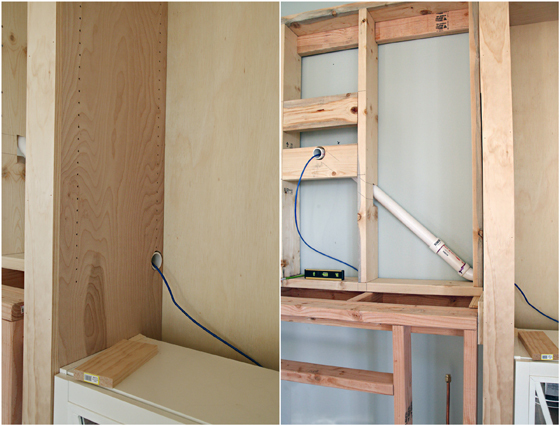 The shelves hold the panels in place (command strips would also help affix them temporarily). Hi: Did you run into any heat/fire concerns with using the surround tile you picked? I love the look and am having a new fireplace installed. I just want it to be heat and fire safe. Any thoughts? I am in the process of building the same type of thing. I bought used wooden bookshelves and a 100-year-old fireplace mantle that was taken out of an old farmhouse. It is beautiful oak. I planned to paint everything white but I hate to paint the mantle now. I ordered an electric fireplace insert. I hope mine turns out as well as yours did! i'm on my own on this! Hoping for the best! Your project turned out beautifully... it's absolutely stunning. I'm doing the same tile for my fireplace surround, and wondering if there's been any blackening or discoloration from the heat or from daily use? It really is a one-of-a-kind look, just love it. Thank you so much! There has been absolutely zero discoloration since installation, and we use the fireplace almost daily. We are still smitten! Was this a gas firepace insert? I love this so much! Where did you purchase the mirrored front cabinet from? I have been searching for ones just like this to use in my own project and I can’t find them!! Can i ask what your budget was for this project? It has been a couple of years now but the lumber was around $500 and the gas fireplace insert was about $1600 plus labor to install the gas line. The tile supplies were about another $100. These are pretty rough estimates based on our memory without going back and pulling all of our receipts. This built-in is beautiful! 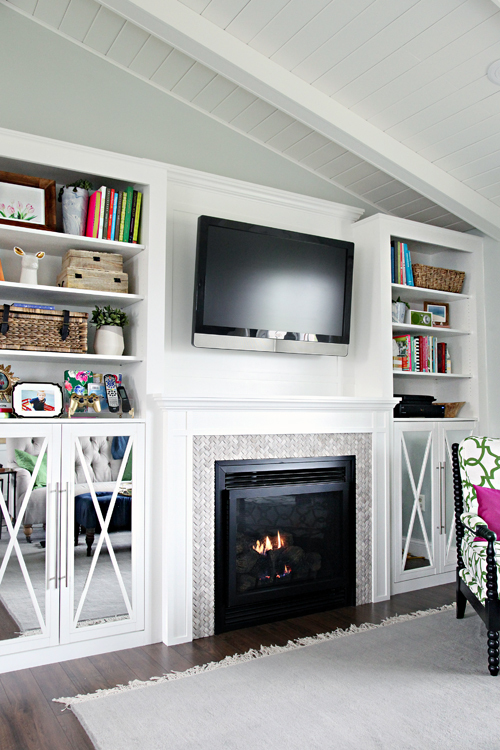 I am wanting to build a similar built-in in my living room. Where did you get the plans to build this? Or if you made the plans yourself, how did you plan it? from a family of carpenters so he also has good resources on call to help. Beautiful job!!! I am IN LOVE with this tile and would love to use it for my fireplace project. On the tile manufacture website the pictures of this tile has more of a cream look..however yours looks grey...what is the true tone to these tiles? Thank you again for sharing! Thank you! The pictures above are very true to color of the tiles we purchased. They are more on the gray side, with some warmer tones throughout. Hi Jennifer, you have done a beautiful job with this project! My husband and I are starting to build our own in the family room now for additional storage and a space to display photos and decor! our proportions are perfect and I want to compare with the fireplace inserts we have been looking at. Hi Jess! Thank you so much and I am excited to hear about your project! 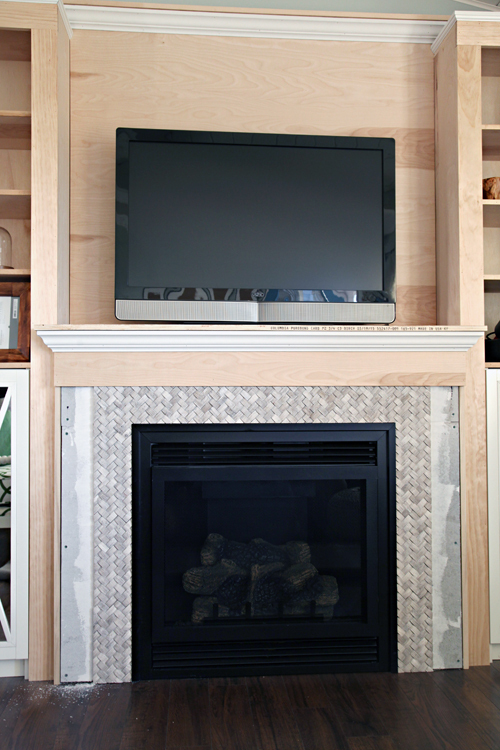 Our TV is a 42" (40 .5" W x 27.5" T) and our fireplace insert dimensions are 36" W x 34" T.